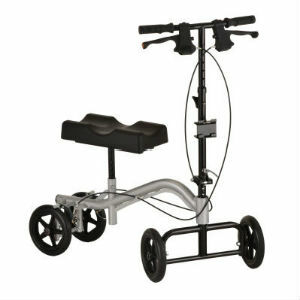 One Stop Mobility offers knee walker rentals to accommodate users with a variety of mobility needs. For example, if you have a broken leg, a sprained ankle, or have recently had any type of leg surgery, renting a knee walker (also known as a knee caddy or knee scooter), is a great choice to use so that you can still have the freedom and mobility to move around. A good quality knee walker will offer safe control and easy turning so that you can still be upright but yet stable enough to safely scoot around. They are a superior option to using against the awkward and uncomfortable crutches. Their design is simple yet unique enough to elevate your leg, thus reducing any possible injuries. Instead, you can recover safely and efficiently without compromising your mobility.